For Immediate Release: Posted On 5/14/2008 By Industrial Magnetics, Inc.
No more heavy, manual lifting! 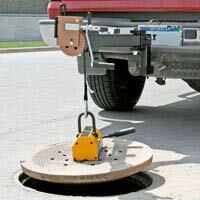 Just drive within 3 feet of the center of the manhole cover and the PowerArm™ adjusts to your location with a 3ft., 180° swing radius and a double-jointed elbow that allows the positioning of the magnet in the center of the manhole cover. Once the magnet is centered and turned to the “lock-on” position, use the winch control to lift the manhole cover from the rim and away from the opening. The PowerArm™ allows quick, easy access to manhole openings and minimizes lifting concerns for an aging or gender diverse workforce. Ideal for survey or pumper crews, the PowerArm™ folds to the bumper for easy transportation and fast setup. With welded, tubular steel construction and a 400 lb. lifting capacity, the PowerArm™ fits into a standard 2” square trailer hitch and is available with an electric or manual winch control. For more information on the New Magnetic Manhole PowerArm™ and to view the demonstration video, please visit IMI on the web at http://www.magnetics.com/product.asp? ProductID=115 or contact us toll-free at 1.888.582.0822.